A proportional integral derivative (PID) control loop monitors an input or process variable, compares the variable’s current value to a desired value (a setpoint), and calculates an output to keep the value very close to the setpoint. 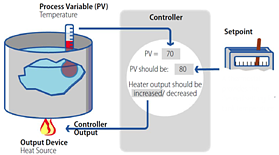 PID loops are used extensively in heating and cooling (HVAC) systems and for other industrial systems as well. Each Opto 22 SNAP PAC rack-mounted controller or brain has 96 PID loops built in. You configure and tune them, and they automatically run locally. Effective with PAC Project and firmware R9.5a, we've changed some PID algorithms. To resolve an issue caused when PID input is supplied by the host, we've changed three algorithms: ISA, Parallel, and Interacting. (The Velocity algorithm was already changed when Velocity Type C replaced Velocity Type B.) For more information about the issue, see KB82058. For more information on PIDs, see the sections on configuring PID loops in the PAC Control User's Guide, PAC Manager User's Guide, or OptoMMP Protocol Guide. Time to tune? When you're tuning your PID loop, try out our online tuner and technical note. And as always, please contact Opto 22 Product Support if you have questions.